Vladimir Romanov. Lock up your managers. The giant of Lithuanian football once more walks among the gnomes that populate the cradle of the game. I thought we'd lost him. First there was the lure of the televised dance floor and then the threats to his not quite global banking empire caused by the worldwide recession. The Edinburgh branch of the Ukio Bankas remained unopened. Hearts seemed rudderless and lifeless. A poet and philosopher as much as a businessman, the gap he left was felt as keenly in our cultural life as our sporting life. And now, like the conquering hero returning from a battlefield, Scotland's premier not-quite-oligarch, conspiracy theorist has come back to us. Just yesteday Csaba Lazlo was speaking publicly about the need for transfer funds to bolster his squad and stop their slide to bottom six obscurity. And today Mr Romanov flew into rally the troops. When it comes to morale boosting motivational speeches it seems Vladimir cast aside his normal Churchillian oratory to adopt the approach of a drunken, ageing headmaster reaching the end of his tether. "It's all your fault" was his message to the players. Rumours that captain Michael Stewart led the team in a spontaneous standing ovation are unconfirmed. But it is always those that love us the most that deliver the harshest truths. And, like a kindly but stern grandfather, Vladimir sugar coated his appearance with a gift. A new sporting director, no less. We do not who as yet but we are led to believe that he has previously worked with Vlad at Kaunus. That does not, on its own, narrow down the field. The conventional wisdom will be that this spells the end for Lazlo, the latest in a long line to pay the price of speaking out about the failing of the Romanov regime. That might well be prove to be the case. But it might also signal a shift in Romanov's style of dictatorship. People who have had dealings with Tynecastle tell me that throughout the business progress and decision making is agonisingly slow because everything has to be checked and double checked with Lithuania before moving forward. On the football side this micromanagement is even worse. It seems clear that Lazlo has compiled a modest but, he felt, necessary transfer list in the summer, pinpointing players who could operate within financial constraints but improve a squad that had lost some big names and personalities. He was frustrated in his attempts because another list, one compiled by Vladimir Romanov or somebody close to him, was given priority. These were players that were either unknown to Lazlo or of demonstrably inferior ability to the players he'd identified himself. Given the lack of transfer activity over the summer it seems that, on the whole, Lazlo has decided that nothing is better than something at times. All this is conjecture based on whispers and circumstantial evidence. I believe, however, that it's not far from the truth. 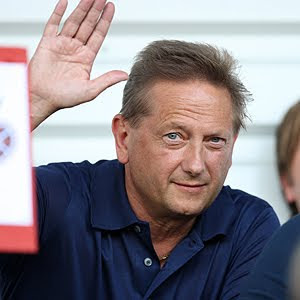 If, and it is a big if, a sporting director is being appointed to either take decisions in Romanov's absence or to act as a direct and permanent conduit for meaningful discussion between owner and manager then it will strengthen rather than weaken Lazlo's position. Lazlo is a likeable man who has performed more admirably in one of Scottish football's more bizarre jobs. But he is not a miracle worker and he needs to be helped not hindered by his boss. Perhaps, just perhaps, Romanov has realised this. Perhaps his ego and his wallet will allow him to help out his manager and get his team back to where they ought to be. On the other hand the sporting director's brief might be to measure Csaba's neck and buy enough rope to get the job done. Or, on the other, other hand, no contract has yet been signed and Romanov is back in Lithuania. We may never see a sporting director. As ever with Mr Romanov only time will tell. As they look at the dwindling power of the Old Firm the frustration for Hearts fans must be at its most acute when they compare the team they have today and the team that George Burley built as the Romanov revolution got underway. What if, Vlad, what if...? The Scotsman reveals Ivan Svabovic. He didn't as I state above manage Kaunas but has experience coaching other Lithuanian side and age group teams at international level. The Scotsman takes a cynical view of the appointment. I am, perhaps unsurprisingly given past form, inclined to agree. But I stand by the view that this might be a decent shout. Romanov hates to lose almost as much as he hates to admit his own mistakes. But Hearts are losing because of his mistakes - this might be his get out of jail card. Good result for them tonight, mind. As we saw last season, as long as Romanov keeps his nose out of the business of running a football club, things go well. As soon as he gets involved, things start going wrong. Expect Laszlo to walk soon, replaced by whoever this yoke is that Romanov has just brought in. A pity, a pity, because with the Old Firm in disarray, the time is right to challenge celtic/rangers, and i dont think there's a team bette rup to the challenge than Hearts right now, if only Romanov would stop messing the club about and stick some money in to actually buy players, and not buy-out managers.